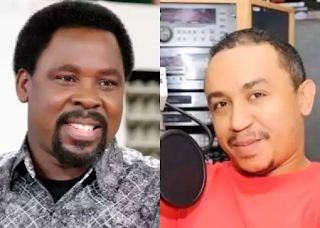 Controversial media personality, Daddy Freeze has praised Prophet T.B Joshua of the Synagogue Church of All Nations, SCOAN, over his message on tithing. According to him, T.B Joshua was the only pastor that has spoken the truth concerning tithing. OAP Freeze over a couple of weeks had called on top men of God such as Pastor Enoch Adeboye of RCCG, Bishop David Oyedepo of Living Faith as well as other Nigerian ministers to prove where God asked people to pay tithes. However in a video shared on his Instagram, T.B Joshua during a sermon said giving tithe to the poor is better than bringing it to the church. According to him, bringing tithe to church is a burden and temptation for pastors because they might not be able to remit all. 0 Response to "Controversial media personality, Daddy Freeze has praised Prophet T.B Joshua of the Synagogue Church of All Nations, SCOAN, over his message on tithing. According to him, T.B Joshua was the only pastor that has spoken the truth concerning tithing. OAP Freeze over a couple of weeks had called on top men of God such as Pastor Enoch Adeboye of RCCG, Bishop David Oyedepo of Living Faith as well as other Nigerian ministers to prove where God asked people to pay tithes. However in a video shared on his Instagram, T.B Joshua during a sermon said giving tithe to the poor is better than bringing it to the church. According to him, bringing tithe to church is a burden and temptation for pastors because they might not be able to remit all. Freeze alongside video wrote “On this tithe issue, Pastor TB Joshua has spoken the biblical truth “And I respect him for standing firmly behind the truth, despite what his counterparts are saying. Free the Sheeple.”"